Gaodetec supply wet shotcrete machine in Middle East. Shotcrete pump is mainly used for spraying or pumping concrete, foam concrete, plaster or mortar. GDS1500 wet shotcrete machine could be used for spraying and pumping concrete, mortar or plaster. Also could be used for pumping foam concrete. Acceptable max. aggregate size is 10mm. Regards the engine, electric motor, diesel engine, gasoline engine choice. 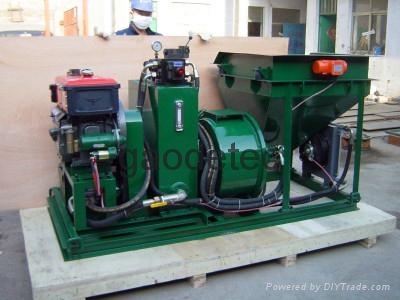 GDS2000 wet shotcrete pump with one agitator to mix slurry avoid sediment. GDS2000 wet shotcrete pump could be used for spraying and pumping concrete, mortar or plaster. Also could be used for pumping foam concrete. Acceptable max. aggregate size is 10mm. Regards the engine, have electric motor, diesel engine, gasoline engine choice. GSZ3000 wet shotcrete pump mainly used for spraying concrete in tunnel building, mines and slopes etc. Acceptable max. aggregate size is 20mm. Regards the engine, have electric motor, air motor, diesel engine for option. Gaodetec also have other types of wet shotcrete machine sales in the Middle East market. So how to find a good Middle East wet shotcrete machine, send an e-mail to info@gaodetec.com or send a message Whatsapp, launch WeChat 86-15903613994 for suitable type right and good price.